New Zealand consumers eat more chicken than any other meat protein source, yes that is a fact. Around 84 million birds are processed for consumption each year. Sadly most from factory farming, however Organic farming methods are becoming more popular thanks to consumer demand. I was vegetarian for a few years, the sight of meat make me feel sick and I was mainly eating this way for ethical reasons. About 18 months ago I had to go on a special "diet" where my Naturopath told me to eliminate grains, all gluten, sugar (including fruit), beans, starchy vegetables, mushrooms, alcohol, dairy and a few other foods for 12 weeks. This left me with errr, vegetables?!. My Naturopath went over my diet and said I was not consuming enough protein so asked If I was open to re introducing animal protein back into my diet. "Yes", I said "But just for 12 weeks right? ", my Naturopath replied with a "Yes". That was good enough for me. One of the first things I did was look for yummy chicken dishes that suited my new dietary requirements. Now if any of you follow the "Paleo" diet you most probably do not eat grains, dairy or gluten. Easy I thought, so had a look around on some Paleo recipe sites for some inspo. The first dish that I made was Coconut Chicken. 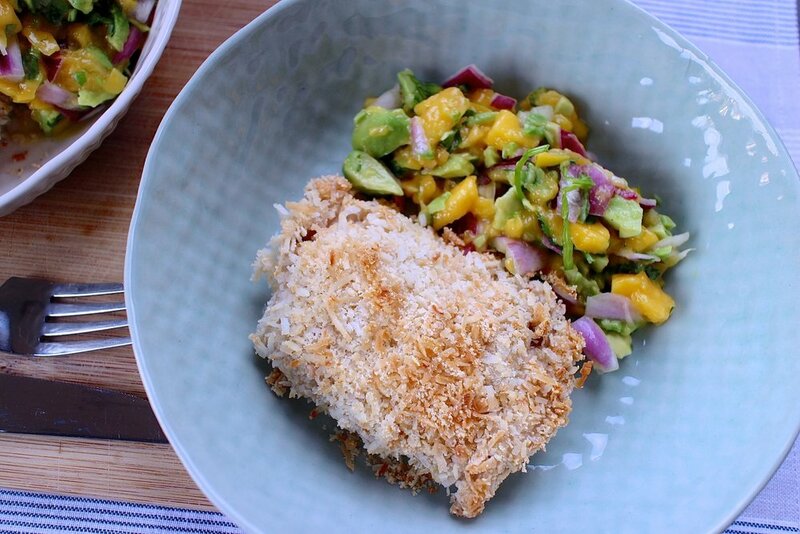 It is SO simple to make and if you are a coconut fan, lactose intollerant or follow the Paleo diet than you are going to love this dish. After 3 months on my special "diet" (boy it was hard!) I was free of my leaky gut and felt like a whole new person. I would say it was largely due to not eating anything processed and significantly reducing my sugar intake. My skin was clear, energy levels higher and I had no "brain fog". This is why it is so important to listen to your body and look out for any signs of it telling you that something may be wrong. Take charge of your health and always seek advice from a professional if you feel you need some guidance. 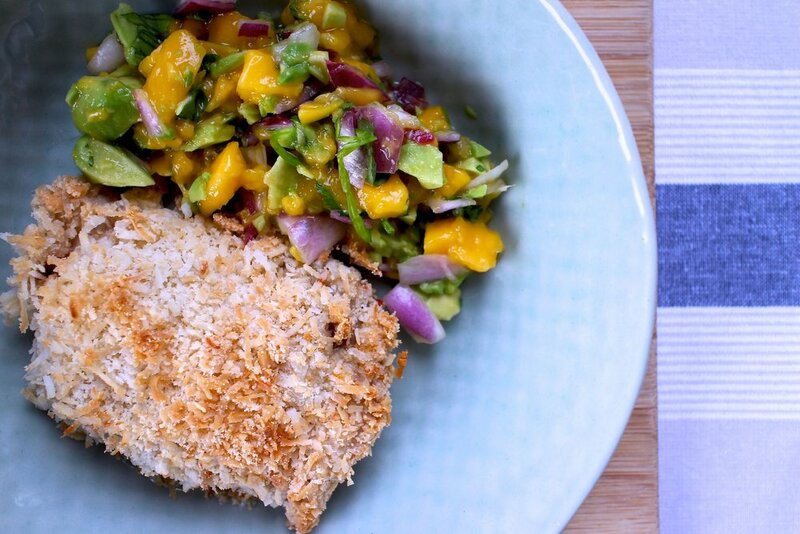 Sovereign are all about empowering New Zealanders to take charge of their health and well-being, so thanks to them I am sharing with you my recipe for Paleo Coconut Chicken with Mango Salsa. 1. Turn oven on fan bake, 180 degrees celsius. Set aside a baking dish that will fit all of the chicken and line with baking paper. 2. In a bowl mix the eggs and coconut milk together. 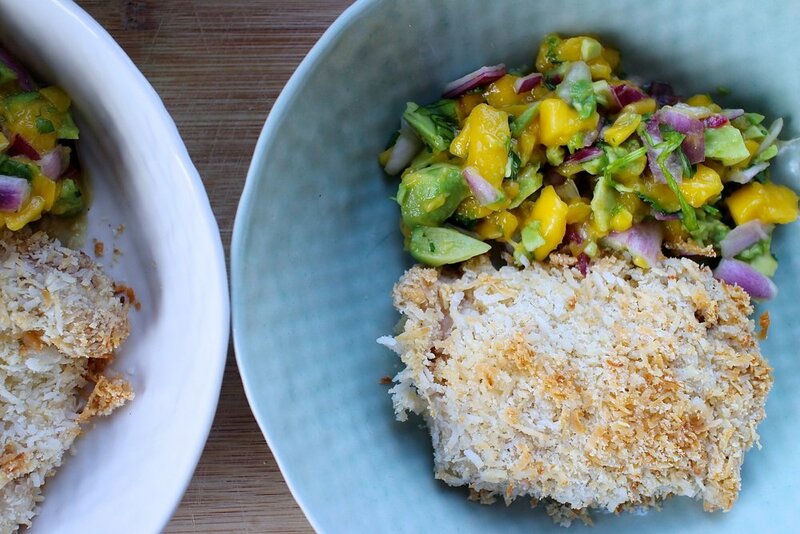 In a separate bowl mix the desiccated coconut and almond meal together. 3. Take the chicken pieces and dip into the egg/milk mixture, then dip into the almond meal/coconut mixture. Place each piece of chicken into the baking dish. 4. Bake for 30 minutes. You will notice that the coconut will go crispy on the outside, keep an eye on it so that the coconut does not burn. To make the salsa throw all of the diced ingredients into a bowl and pour the lime juice over. Place into the fridge to marinade while the chicken is cooking. This post was made possible thanks to Sovereign.